Department of Medical Microbiology: School of Medical Laboratory Science, AhmaduBello University Teaching Hospital, Zaria. Background: Macrolides have been used in treatment of infectious diseases, since the late 1950s. Erythromycin or other Macrolide can be used in treatment of patients who are allergic to penicillin. As with other antibiotics there is increasing global concern regarding the progressive development of bacterial resistance to these agents. Objective: This study was carried out to determine the prevalence of macrolide-resistant enteric bacteria among febrile patients attending selected hospitals in Zaria. Methods: The enteric bacterial pathogens were detected by Culture, Gram technique and Biochemical tests both conventionally and Micro Gen ID. On the basis of the in vitro activity of enteric pathogens, studies of Azithromycin and four commonly used macrolide antibiotics was carried out. Results: Three hundred and fifty (350) febrile patient’s blood samples were cultured, of which 75(21.4%) yielded positive growth. Of the positive samples 37(49.3%) were microbiologically documented as Gram negative-enteric bacteria mainlyEscherichia coli 20.0%, Salmonella typhi 12.0%, Klebsiella pneumoniae 9.3%, Acinetobacter haemolyticus 4.1% and Enterobacter aerogenes 4.1%.The macrolide susceptibility of enteric bacteria from bloodstream of febrile patients in Zaria indicates: Clindamycin 2(5.4%); Erythromycin 4(10.8%); Clarithromycin 5(13.5%);Telithromycin 8(21.6%);Azithromycin 16(43.2%).The rate of macrolide resistant enteric bacteria in Zaria is show Clindamycin 29(78.4%), Clarithromycin 24(64.9%), Erythromycin and Telithromycin 22(59.5%) each and Azithromycin 13(35.1%). Conclusion: The study shows that among the enteric bacterial pathogens macrolide resistant Escherichia coli, Salmonella typhi and Klebsiella pneumoniae were among the leading causes of febrile illness in patients age >15 years. This highlighted the major contribution of resistant Gram-negative bacterial diseases in febrile patients to hospital admissions in BSIs other than Malaria and other Gram-positive bacteria. Key words: Resistance, Macrolides, Enteric bacteria, Febrile, Blood stream infections, prevalence. Macrolides are a group of drugs (typically antibiotic) whose activity stems from the presence of a Macrolide ring ,a large macro cyclic lactones ring to which one or more de-oxy sugars, usually, cladinose and desosamine may be attached. The lactones rings are usually 14-, 15-, and 16- membered. Macrolide belong to the polyketolide class of natural products. They are commonly used to treat respiratory tract infections. Three of the most widely used agents in the class of Macrolide are Azithromycin (Pfizer), Clarithromycin (abbot), and Erythromycin (generic).Erythromycin or other Macrolide can be used in treatment of patients who are allergic to penicillin(Jaggi etal.,2007).Felmingham et al., (2002) reported an outbreak of resistant Streptococcuspneumoniae to Erythromycin and Azithromycin. The incidence of BSIs is high in the tropics and the initial treatment is usually with broad spectrum empiric antibiotics. This indiscriminate ‘blind’ treatment has in many instances given rise to ineffective treatment with relapses, complications and development of resistance with increasing number of bacteria becoming resistant to available antibiotics. Febrile illness is a leading reason for admission to hospital in Africa ( Petersetal,2004).Febrile illness are fuelled by the HIV epidemic (Onankpaetal, 2008). Fever or febrile illness was defined by Hughes etal. (2002) as a single oral temperature of >38.3oc(101oF) or a temperature of >38oc for 1hr.Fever higher than 38.9oc associated with BSIs (Brentetal, 2006; Bellet al,2001;Peters etal, 2004).The in vitro activity of azithromycin against enteric bacterial pathogens show high activity against campylobacterspp, E.coli, Shigellaspp, Salmonellaspp; including Salmonellatyphi. Malaria has been the primary focus of work on fever-related illness in sub-Saharan, Africa for decades because of its high prevalence and simple laboratory diagnosis, while laboratory capacity to diagnose non-malaria causes of fever has been limited (Reddy et al.,2010).In Nigeria ,the outcome of treatment of neonatal septicaemia has remained poor, with reports of mortality of 33% to41% two tertiary hospitals in the country (Adeleke and Belenwu,2006;Martins et al.,2005; Mokuola et al.,2002;Nwodioha et al.,2010).The results of bacteriological cultures and antibiotics susceptibility tests take 3-7 days (Kavitha et al.,2010).Thus it is a common practice to institute early empirical treatment with broad spectrum antibiotics in patients presenting with symptoms of bacteraemia (Murty and Gyanshwari,2007).This is only possible with knowledge of commonly isolated bacteria and their susceptibility to antibiotics in a given place(Shahlaet al.,2009). Malaria has been the primary focus of work on fever-related illness in sub-Saharan, Africa for decades because of its high prevalence and simple laboratory diagnosis, while laboratory capacity to diagnose non-malaria causes of fever has been limited (Reddy et al.,2010).In Nigeria ,the outcome of treatment of neonatal septicaemia has remained poor, with reports of mortality of 33% to41% two tertiary hospitals in the country (Adeleke and Belenwu,2006;Martins et al.,2005;Mokuola et al.,2002;Nwodioha et al.,2010).The results of bacteriological cultures and antibiotics susceptibility tests take 3-7 days (Kavitha et al.,2010).Thus it is a common practice to institute early empirical treatment with broad spectrum antibiotic, since patients are presenting with symptoms of bacteremia(Murty and Gyanshwari,2007).This is only possible with knowledge of commonly isolated bacteria and their susceptibility to antibiotics in a given place (Shahlaet al., 2009).Blood Stream infections (BSIs) rival malaria as a common cause of morbidity and mortality in sub-Saharan African (Reddy et al, 2010). The most important older members of the group are erythromycin, oleandomycin, triacetyloleandomycin and spiramycin. Newer macrolides are semi-synthetic molecules that differ from the original compounds in the substitution pattern of the lactones ring system; they include Roxithromycin, Clarithromycin, Azithromycin (Stephen et al., 2004). The study coveredtwo Local Government areas (Zaria,Sabon gari) of Kaduna State, Nigeria. oral temperature of =38.3?C (101? F) or a temperature of =38?C for 1 hr or alternatively, those with fever higher than 38.9?C associated with BSIs. Blood samples (4mls) werecollected through venipuncture from the Median cubital vein in adults and from the suprapubic region under aseptic technique in infants into a pair of Brain-Heart infusion (aerobic) and Thioglycollate (anaerobic) broths. Blood samples were collected before antimicrobial treatment has started. The Samples were properly registered before transport to Microbiology Laboratory Ahmadu Bello University Teaching Hospital, Zaria for incubation and bacteriological analysis. Blood culture bottles were incubated at 37?C for up to 7days and regular subcultures done at 24,72hrs and 7thday. Subcultures of blood culture broths were done on Blood, Chocolate and MacConkey’s agar plates. The tops of the bottles were sterilized with ethanol-ether swab using a sterile needle and a 2ml syringe in each case, about 1ml of the broth culture was withdrawn from each bottle through the rubber liner in the caps .The withdrawn broth cultures was then inoculated on the plates. Blood/chocolate agar plates were incubated in aerobically and in candle extinction jar to provide CO2 while MacConkey’s agar was incubated in air at 37oC for 24hrs. The tops of the culture bottles were sterilized again with ethanol-ether swab and re-incubated after each withdrawal. The identification of organisms was carried out by Gram reaction and Microscopy, colonial morphology, biochemical and serological characterization of isolates to species level, performed according to recommended guidelines (Cheesbrough, 2005). The tartive enteric bacteria isolates were further sent to a reference Laboratory for confirmation using Microgen A-ID System (Microgen Bio-products, 2003). The resistance pattern of pure bacterial isolates was determined by disc diffusion method.The Macrolides included in the tests were Erythromycin (15µg), Azithromycin (15µg) Clarithromycin (15µg),Telithromycin(15µg) and Clindamycin (2µg) manufactured by Oxoid and Liofilchem Ltd.
A sterile straight wire was used to touch 5 colonies of each isolate and suspended in a sterile Bijou bottle containing 5ml peptone water (Lab M) which was incubated overnight at 37oC.The overnight broth cultures were diluted with sterile saline to 106(Cfu) per mL and comparing the turbidity of the inoculum with 0.5 McFarland turbidity standard (Cheesbrough, 2000). A sterile cotton-tipped applicator is then introduced into standardized inoculums and used to inoculate dried plates of Muller-Hinton agar (oxoid, England). Sterile single antibiotic discs were then aseptically placed on each inoculated plate and incubated for 24hrs aerobically at 37?C. Zone diameters of inhibition of each isolate to the disc was measured and resistant ones Laboratory Standards Institute (CLSI) to determine sensitivity or resistance (Ferraro, 2000).The CLSI quality control values were used to cross check correctness with the new guidelines for antibiotic disc Susceptibility tests. Gram-negative enteric bacteria including Escherichia coli 15(20.0%),Salmonella enterica typhi 9(12%), Klebsiella pneumoniae 7(9.3%), Acinetobacter haemolyticus 3(4.0%) and Enterobacter aerogenes 3(4%). 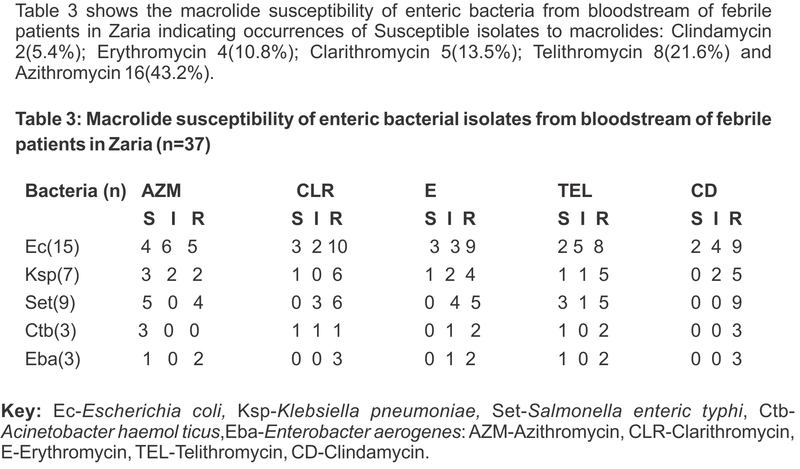 Table 1 shows the distribution of bacterial isolates from the study area.Escherichia coli 15(20.0%) and Staphylococcus aureus were the highest recorded isolates while Viridians streptococci 2(2.7%) were the least frequently isolated. Macrolide resistance (MR) has been well documented in several countries and has become clinically significant since the large increases in macrolide usage during the 1980s.Macrolide resistance has also increased dramatically during the last decade (Pallereset al.,2005).There are several case reports of failures of macrolide antimicrobials in treatment of infections leading to major public health problems. Bacterial infections in febrile patients are a major cause of morbidity and mortality .In thisstudy 75(21.4%) bacterial isolates were microbiologically documented from BSIs with 38(50.7%) Gram-positive organisms and 37(49.3%) Gram-negative enteric pathogens (0.5>p>0.1) as in table1.This rate is slightly higher than that reported by Nwadiohaet al. (2010) in Kano but relatively low compared to 44.9% in Calabar (Martins et al.,2005) and 30.8 in Ilorin(Mukuolaet al.,2002).The probable reason is that this study involves all febrile cases while other studies involved only children suspected of septicaemia.Most studies have reported isolation of more Gram negative organisms(Nwabuisi and Nwafor,2000).However the finding of more Gram positive isolates (50.7%) is a reflection of similar reports and reasons in Europe and USA (Siefert andWisplinghoff,2005;Guilarde et al.,2007).The most predominant enteric bacteria isolate (Table3) is Escherichia coli 15(40.5%),others are;Salmonella typhi9(24.3%),Klebsiella pneumoniae 7(18.9%),Enterobacter aerogenes and Acinetobacter haemolyticus 3(8.1%) each.The frequency of enteric isolates is higher in females aged 15-24 years 7(18.9%) and 6(16.2%) in males, slightly lower than a previous study in Abuja,Nigeria that recorded 22% females and 17.9% males (Iregbuet al., 2006).The reason for this is the anatomy of the female reproductive organ or it is only suggestive that females are more susceptible to bacteraemia than males. 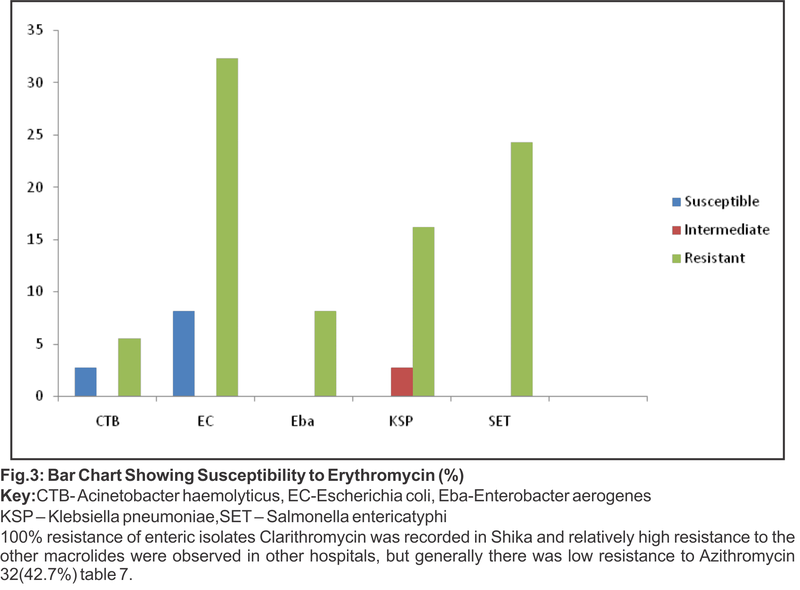 In this research a high resistance of enteric pathogens isolated from blood stream of febrile patients in Zaria was observed (Table 7).Isolates from Shika were 100% resistant to Clarithromycin and Clindamycin (P<0.05 at 95% CI) similar to that reported by Tariq et al., (2003), probably because the hospital is a tertiary hospital.Multi-drug resistance of many bacteria to many antibiotics has been reported in developing countries due to misuse of antibiotics. 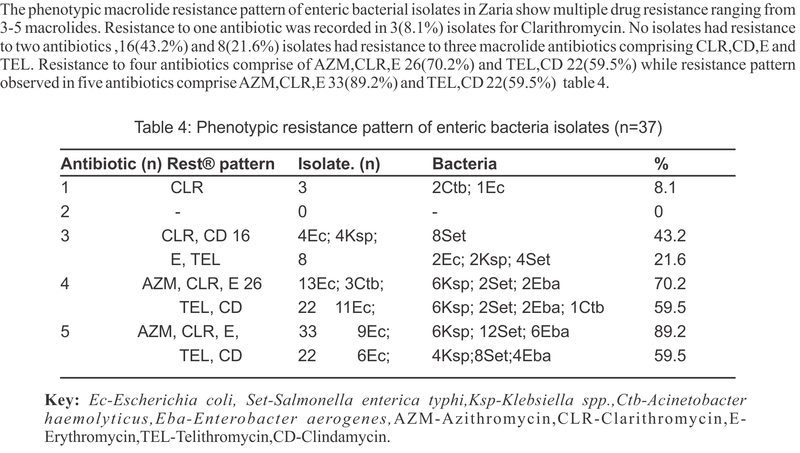 In this study the phenotypic resistance pattern (Table 5) of Gram negative enteric bacteria showed multiple drug resistance with a number of the macrolide antibiotics ranging from 3-5 with the highest phenotypic resistance pattern showing isolates being resistant to 5 macrolide antibiotics [AZM,CLR,E 89% and TEL,CD 59.3%] the least of the multiple resistance with 3 antibiotics [CLR,CD 43.2%,and E,TEL 21.6%].The high resistance rates to these antibiotics in this study and in recent studies may be a reflection of the abuse and misuse of these agents coupled with the inherent resistance mechanisms of the enteric bacteria as observed by Okeke and Sosa,( 2003).The implication for the presence of these multiple drug resistant organisms on our already strained health care system leads to longer hospital stay,more expensive toxic drugs and higher mortality rates. 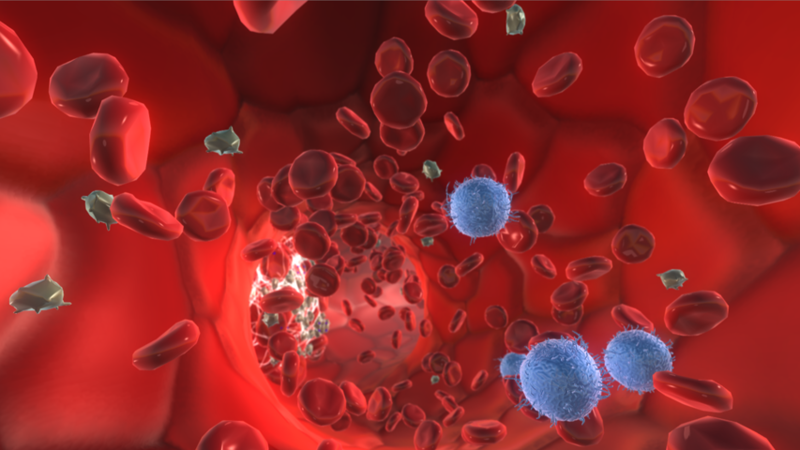 The highest rates of macrolide resistant bacteria are observed in age group 15-24 years. 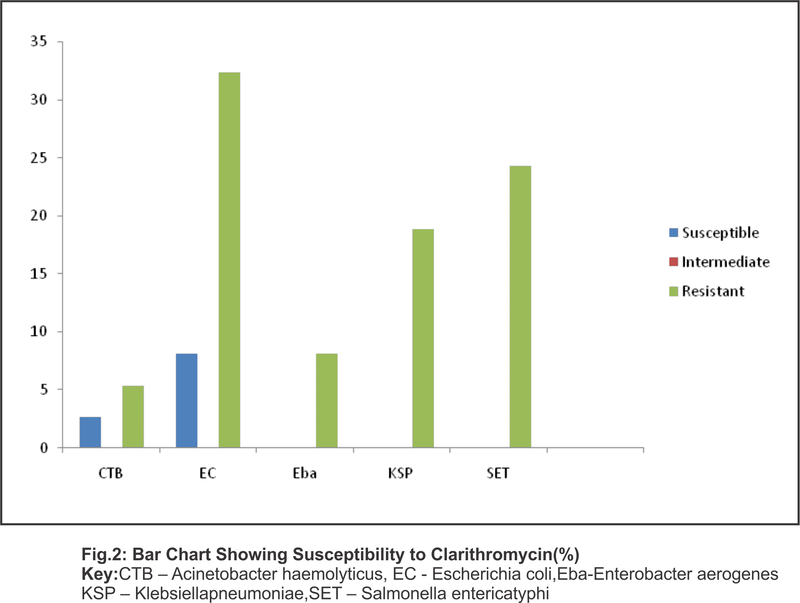 Clarithromycin and Clindamycin 25% each(Table 8),the lowest resistance is recorded in age group >45years with Azithromycin and Clarithromycin; similar to findings of Surbhiet al .,(2003).The incidence rate of macrolide resistant enteric bacteria show Escherichia coli being more prevalent ;Clindamycin 35.1%,Clarithromycin and Erythromycin 32.4% each,Telithromycin 29.7%,and Azithromycin 18.9% resistant Enterobacter aerogenes has the least occurrences with a rate of 8.1% for all the antibiotics except Azithromycin 5.4%(Fig.1-3).Similar work done by Joshua et al.,(2006). This work shows that among the enteric bacterial pathogens, macrolide resistant Escherichia coli,Salmonella entericatyphi and Klebsilla sp. are the leading causes of febrile illness in patients >15 years, other enteric isolates prevalent in the study area are Acinetobacter haemolyticus and Enterobacter aerogenes. The study also revealed that empiric treatment of febrile patients is significantly associated with outcome of culture and sensitivity test results of suspected bacteraemia due to multi-drug resistant strains recorded. This research also showed that azithromycin can be used as a drug of choice for treatment of bacteraemia due to enteric pathogens. 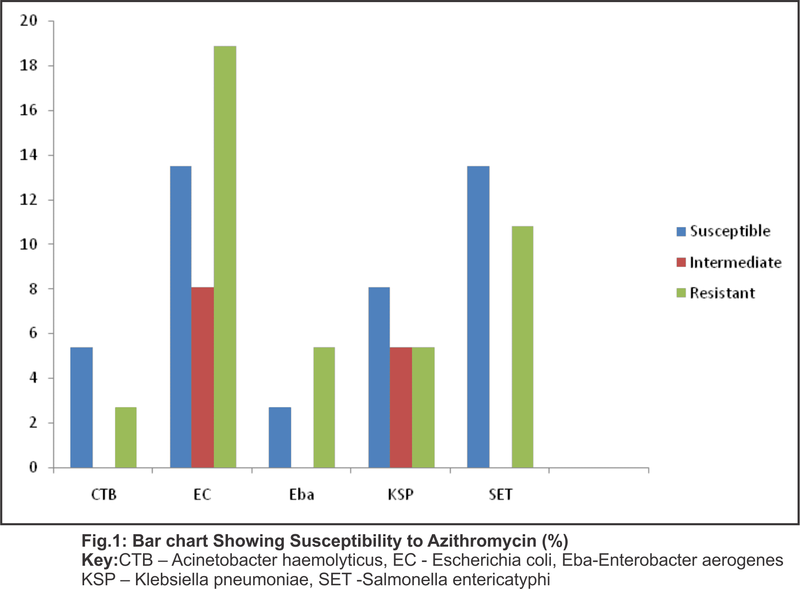 The rate of macrolide resistant enteric bacteria in Zaria is Clindamycin 29(78.4%),Clarithromycin 24(64.9%),Erythromycin and Telithromycin 22(59.5%) respectively, and Azithromycin 13(35.1%). The high macrolide resistance recorded among Gram negative enteric pathogens suggests that if no effort is done to control use of antibiotics, most especially macrolide antibiotics in the communities ,then we are leading for a doom in terms of antibiotic usage. 1. National policies should be formulated to combat development of resistance and control macrolide antibiotic usage. 2. Health institutions should undertake isolation and determination of susceptibility pattern of the prevalent causative organisms of BSIs of their localities periodically to reduce erroneous diagnosis of febrile illness. 3. It should be made mandatory to determine the spectrum of locally prevalent pathogens and their susceptibility to antimicrobials before placing febrile patients on empiric antimicrobial regimens to prevent longer hospital stay, reduce cost of treatment and mortality rates. 4. Further investigations should be carried out in order to find solution to genotypic resistant mechanisms of the enteric bacteria prevalent in our settings. 1. Adeleke,S.I. 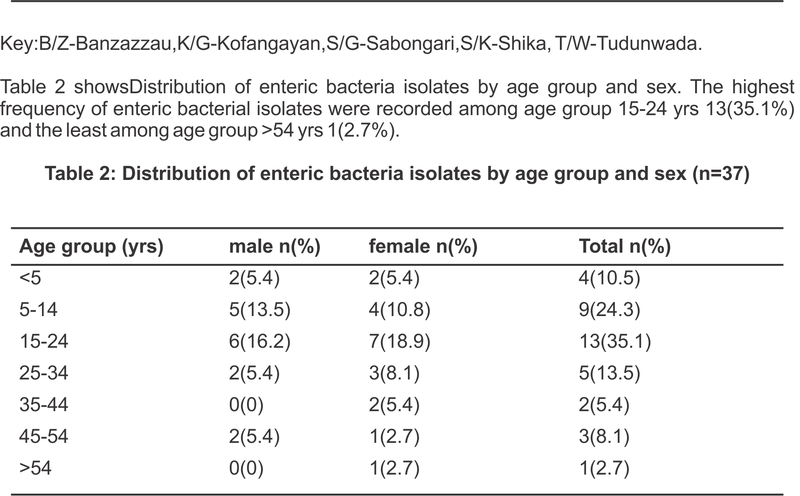 and Belunwu(2006):Bacterial isolates in neonatal septicemia in Kano. Nigeria pinnacle international journal of medical science 1(1):17-20. 2. Bell M, Archibald LK, Nwanyanwu O et al., and (2001). Seasonal variations in the etiology of BSI in a febrile inpatient population; in a developing country. International Journal ofinfectious Disease; 5:63-69. 3. Brent A J, Ahmed I, Ndiritu M, et al.,(2006). Incidence of clinically significant bacteremia in children who present to hospital in Kenya: community base observational study.Lancet; 367:482-88. 4. Cheesbrough M., (2001). District Laboratory Practice in Tropical countries, part 2. Cambridge University press, UK: 139-43. 5. Cheesbrough,M. (2005):District Laboratory Practice in Tropical Countries. Part 2. Cambridge University press, UK: 124-130. 6. Felmingham, D., Reinert, R.R.,Hirakata,Y.et al.,(2002). Increasing prevalence of antimicrobial resistance among isolates of Streptococcus pneumoniae from the PROTEKT surveillance study and comparative in vitro activity of the ketolide, telithromycin. Journal of Antimicrobial chemotherapy; 50(1): 25-37. 7. Ferraro M J, Craig W A, Dudley M N, etal.,(2000) Performance standards for antimicrobial discs susceptibility tests.7thEd. Approved standard M2-A7 Wayne P A. National Committee for clinical Laboratory standards. 8. Guilarde, A.O, Turchi,M.D, Martelli,C.M, Primo, M.G, deAbreu Batista, L.J (2007).Bacteremia at a Teaching Hospital:etiology, antimicrobial Sensitivity pattern and Risk factors for mortality. Rev.Assoc.Med Bras Journal.53:34-38. 9. Iregbu, K.C, Olufumilayo, Y.E, Iretiola, B.B, (2006): Bacterial profile of neonatal septicemia in Tertiary Hospital in Nigeria. African Journal ofHealth Science;6:151-154. 10. Jaggi P, Beall B, Rippe J, Tanz R R. Shulman S T.(2007). Macrolide resistance and emm type distribution of invasive pediatric group A streptococcal isolates: Three Year prospective surveillance from children’s hospital. Pediatricinfectious Diseases Journal; 26(3):253. 11. Joshua,P.M., Neil, O. F., Marshall,M.J., Michael, J.
K., Jesse, L., Chittams, and Paul, H.E (2006). macrolideresistance in adults with bacteremicpneumococcal pneumonia. Emerging infectious Diseases; 12(8):1223-1230. 12. Kavitha, P., Sevithav, B., Sunil, R. (2010): Bacteriologic profile and antibiogram of blood culture isolates in a paediatric care unit.Journal of Laboratory Physicians 2(2):85-88. 13. Martins,M.M.,Chukwuemeka, N.E.,Anne, E.A.,Joseph ,U.O.,Simon E.A. (2005).Bacterial Isolates from blood cultures of children with suspected septicemia in Calabar Nigeria.BMC Infectious Disease 5:110. 14. Mokuola,A.O, Jiya,N.,Adesuyin, O.O. (2002): Neonatal septicemia in Ilorin: Bacterial pathogens and antibiotic sensitivity pattern .African Journal of Medicine and Medical Science.31:127-130. 15. Murty D S, Gyaneshwari M.(2007). Blood cultures in paediatric patients: A study of clinical impact. Indian Journal of Medical Microbiology;25:220-224. 16. Nwabuisi C. and Nwafor A.C.(2000). Bacterial agents of septicemia in childhood in Ilorin. Nigerian Journal of Medicine: 9(3); 86-88. 17. Nwadioha, S. I, Nwokedi, O. P, Kashibu, E, Odimayo,M.S.andOkwori, E. E.(2010).A review of bacterial isolates in blood cultures of children with suspected septicaemia in a Nigerian Teaching Hospital.African Journal Microbiology Research.4:222-225. 20. Pallares R., Fenoll A., &Linares J. (2005).The Spanish pneumococcal Infection Study network. The epidemiology of antibiotic resistance in Streptococcus pneumoniae and clinical relevance of resistance to cephalosporin,macrolides and quinolones; International Journal of Antimicrobial Agents; 22: 15-24 . 21. Peters, R. P., Zijlstra, E. E., schijffelen, M. J., et al., (2004). 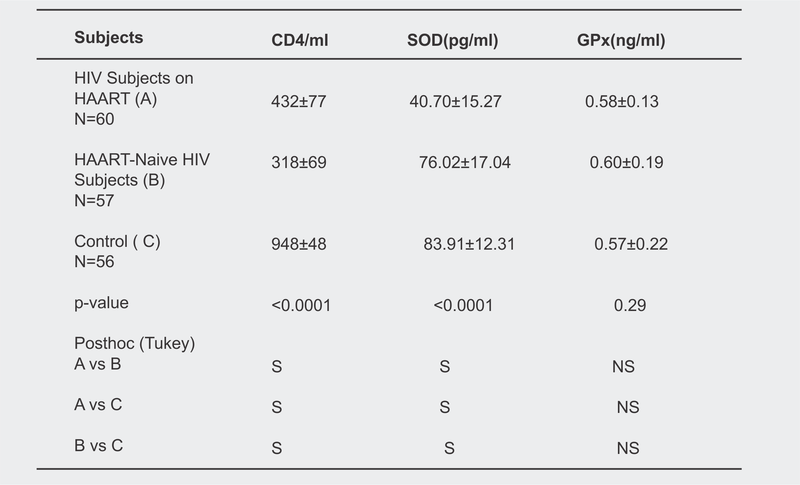 A prospective study of blood stream infections as a cause of fever in Malawi: Clinical predictors and implications for management. Tropical medicine &.International Health: 9:928-34 [pub med].Systematic review and meta-analysis.The Lancet Infectious Diseases. 10 (6):417-432. 22. Reddy,E.A., Shaw, A.V. and Crump,J.A.(2010). Community acquired blood stream infections in Africa: a systematic review and meta-analysis .The Lancet infectious diseases. 10(6): 417-432. 23. Siefert, H and Wisplinghoff,H. (2005).Blood stream infections and endocarditis. In Bordello, S.P, Murray, P.R, Funke, G. (Ed). Topley and Wilson’s Microbiology and Microbial Infections vol.1,10th Ed. London: 509-526. 24. Shahla, L., Saeed, M .A., Ishtlaq, A. (2009).Bacterial pathogens responsible for bloodstream Infections (BSI) and pattern of drug resistance in a tertiary care hospital of Lahore. Biomedica.25 (8):101-105. Microbiology. Blackwell Publishing (7th Ed. ): 166 168. 26. Surbhi, M, Christine L, Samuel, C., Koen V. H, Herman G.(2003).Effect of azithromycin and clarithromycin therapy on pharyngeal carriage of macrolide-resistant Streptococci in healthy volunteers: a randomised,double blind,placebo controlled study. 28. WHO (1989).Manual of Epidemiology for District Health Management. Antibiotic resistance and serotypes of invasive streptococcus pneumoniae Isolated from Patients attending Acute care Health facilities in Kaduna state, Nigeria.